This page is going to be an ongoing Blog of the animals and the changes we make to the barn. There are introduction categories to help you know who and what we have on our One Acre Farm, below. Every Month I will give updates on the Barn and its Critters, along with pictures. Hope you enjoy! To see more pictures just click the links to the photo albums. Seems like the months fly by and then I realize that I have not updated with everything going on here. Hard sometimes to sit down and write about what’s going on here, when there is so much to be done here. Let’s see….where to start. I told everyone about our new addition Jack and he is adjusting well to life here on the farm. Dingo is learning to love him in small doses. Almost like watching an older brother dealing with a much younger little brother, but they do get along well. We added some new additions to the farm this winter. We now have a Rooster on the Farm and his name is Foghorn. He came with 2 hens, Ms. Prissy and Ms. Petunia. They are Lavender Orpingtons and this spring we hatched our first Cranberry Acre babies! Foghorn is a daddy! We were so excited to hatch our own and will be doing so all year. My daughter Ayla this year is raising baby chicks and ducks to sell here locally. Been a fun learning experience for all. All the other Cranberry Critters are up to the same old same old. Ms. Buttons and the goats, (Bella and Sparkles), continue their saga on ruler of the pasture, but all seem to play by the same rules in the end. Ms. Silver is still kicking it like she is 2 years old. Crazy to think she is 8 going on 9 this year. Oh almost forgot, our first new hatchlings are staying here on the farm! We couldn’t part with this group, so everyone gets to see them grow up! Can’t wait to show you more pictures. We are making renovations to the Chicken coop. If you have read some of our older posts, you would know that the original barn kept both chickens and livestock, which was hard. 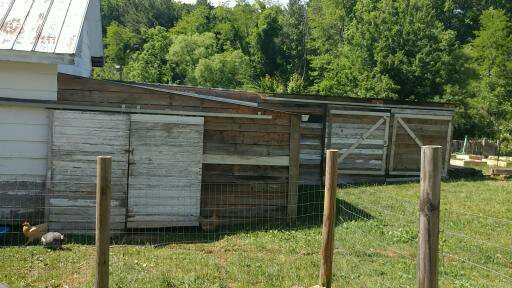 Since the new addition with the stalls, we have been using the older section as a chicken coop. We are in the process of cleaning up and making a better coop for our girls and the possibility of housing 2 turkeys in with them. We have done a lot of research on turkeys and have learned to keep our girls and them together daily cleaning, plus deworming quarterly, is the key. Our hopes are to have this done by the end of summer, we will see, but that is my hope. We are taking out the old section that was the chicken coop and will design the whole space for the chickens. We are wanting to take the old floor out, so we can cement the floor, but this will be a project for next year. Cementing the floor will allow us to sanitize better and help keep the turkeys safe, while in the coop, but like I said will be next year to do this. The one thing I have learned is setting realistic goals, so you feel better about the accomplishment. The old stairs are coming out and we are adding doors to the hayloft outside with a working pulley to get hay up there. We will be having a nursery for the chicks and ducklings, along with a small area for a hospital, in the event a chicken is sick. The new roosts will be hinged to the ceiling so we are able to pick up and latch, so cleaning the coop will be easier. Right now we are in the demo stage! The coop is a mess and the girls really hate me right now. I will be documenting the demo and the new coop build as we go. If you would like to see more pictures of the Cranberry Critters or the coop renovations, please click on the links below. Thank you for supporting Cranberry Acre. Please click the link to go to the Store. Yes it has been a long time since we have written anything about the farm and its critters. We had a very busy fall and the winter got away from us. We did lose some critters this fall due to old age, only our chickens. It hurt a lot to say good bye. We did gain a new duck. His name is Mounds, and we do hope that we will have ducklings on Cranberry Acre this spring. It did take a little while for Coconut and Hershey to like him, but now they waddle around the pasture together. Our newest addition is a puppy! We have always been a one dog family, but we now have two dogs in our life. We found this little guy on the road on one of the coldest nights we have had. We tried to find his home but no one would claim him. Of course we got attached, so we decided to keep him. Meet Jack, yes after Jack Frost! He has turned our household upside down, but he is fitting in fine and finding his place. 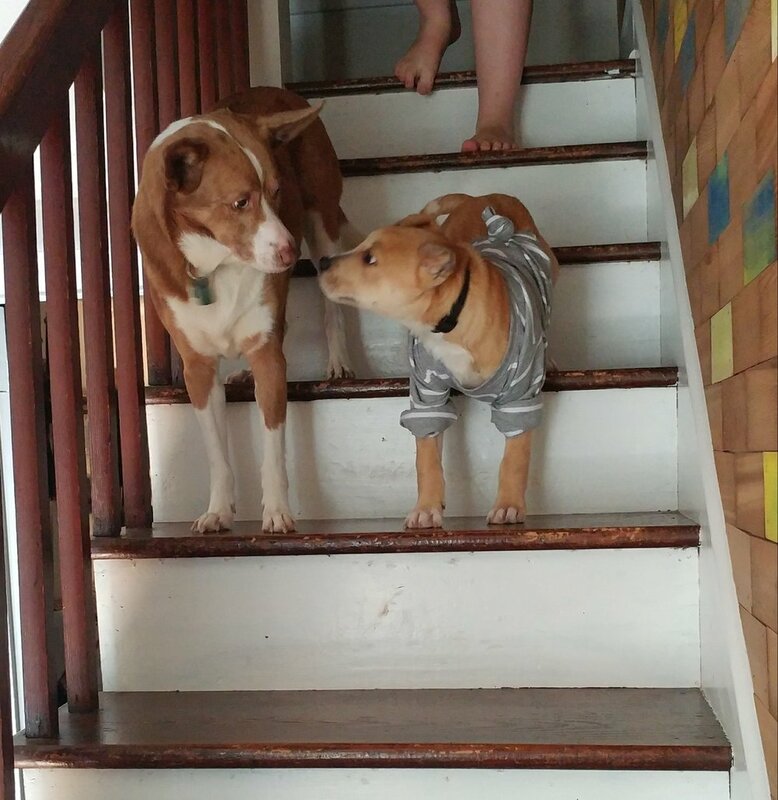 His big brother Dingo is learning a hard lesson about puppy patience, but is doing great. Should be an interesting Year with our new additions. If you would like to see more pictures of Jack please follow the link below to our Cranberry Critters , photo album. We will start this blog out on a great side, Big Mama pulled through and is back to bossing around other chickens. We were so worried that we were going to lose her, but she is still with us. There is really nothing new with our Critters. Everyone survived the Grand Opening and are now known by many kids who came to meet them. It was such a great time had by all. We now have their pictures up in the barn so everyone can know them by name. It has been fun to hear the stories of the children who got to visit, talk about the Cranberry Critters. To see more pictures of our Cranberry Critters, please click on the link. Life on a farm is fun to watch. The critters that fill our pastures are a part of the family, so when a chicken gets sick, I do my best to make it healthy again or make it as comfortable as I can for the bird. Big Mama came down with something and now has been separated from the flock for 2 weeks. Chickens are really not good about being alone, but since her symptoms seemed like she could be contagious, we decided to separate her for the good of the flock. We treated with drenches and Veterx drops in her water and left her to sleep as much as she wants. As of today she seems to be acting more like a chicken, but she isn’t out of the woods. She is a 4 year old chicken so, by chicken years she is an aged bird, but we will keep our fingers crossed for her. We have many deep springs on our property that have been a challenge at times to deal with. We lost 2 of our peach trees due to springs we did not know about. For wells and water tables this is great, but sometimes when one of these springs decides to make an appearance, well it can be a mess. We knew about one of these springs and decided a few years back to plant a Willow tree by it to help with the excess water. This has worked for a while, but this year we are gaining a swamp! The chickens and the ducks love it and have made it their goal to make this swamp a pond! It is a mess down by our Willow tree and really there is not much we can do but trim around the area to keep the grass low and see how big it wants to get. In the future we may be looking at digging this spring out to make a small pond so we don’t lose land to a swamp situation. Pasturing an acre our grass is much needed. This year we have had a few visitors to the farm. Our House Wren has come back for the 4 year to raise her babies in the now Chicken coop. We also have had a pair of house finches, who have come every morning to eat when I feed the chickens. They have nested somewhere close but I have not found them yet. Our thrasher is back for the 8th year in a row, bouncing all over the property and finding bugs in the ground. This bird has always dust bathed in the burn pile since we moved here, not one bit scared of us at all. Now our chickens look at this bird as an annoyance but I love it.Well the barn has been painted! I finally after all these years, am the proud owner of a red and white barn. Can’t tell you how happy I am and it wouldn’t have been as soon as it is, if it wasn’t for my friends helping on that day. Just so pretty. I’ll end this Critter blog with our goat Bella. Our goats are now 8 years old, but I tell every day is still an adventure with them. For whatever reason Bella fights with my garden hose, why? I do not know! I find it so funny that every day she is out there having an argument with it sometimes losses, this event pictured it was a tie and I did not need to go out and rescue her. To see more pictures of our Cranberry Critters, please click on the link below. Nice to say that the Critters are all doing fine! With our animals aging, we always seem to have one under the weather, but as of now we are all good. Virginia has seen its share in rain this past month. Our fields have been rain soaked so bad that when you step out into them the water runs around your boots. This has presented in a problem in our new addition of the barn. It is wet! We are having to pay close attention to our goats and horse feet, to make sure no one gets soft or rotten feet. Everyone is doing great! Buttons had soft feet due to the wet but we have been cleaning them daily to prevent any problems. All the chickens are doing great. We have a couple of broody hens and one very broody duck! Coconut has been broody for weeks and we are doing are best to keep her off a nest! She has gone crazy, but hopefully she will come to her senses very soon. We have acquired some new critters in our barn. Our house wren is back again and has built a nest on the same spot this year. She has been now doing this for about 4 years. Can’t wait to hear babies in the nest. We also have a cat. I was hoping Mr. Bayne would chase this one off as he has many times with others but for some reason Bayne has a soft spot for this young male cat. This stray has been here hanging around for at least 3 weeks or more, so I have come to the conclusion we are being forced into a barn cat. Now to catch and neuter this boy. Once neutered, we will be searching for a name for him. To see more photos of our Cranberry Critters, please click the link below. Thank you. This was a hard month for us on the farm. One of our sweet little birds had been sick on and off again. She again was an old bird, but Ms. Puffy Cheeks was a sweet little bird. We lost her a few weeks ago, not really sure what it was and really old age was probably the killer. She went to sleep and never got up. She was one spoiled bird here on Cranberry Acre, because she had my heart. Ms. Puffy cheeks will be missed, but not forgotten, due to the numerous pictures of her with her sister, who also has passed. Everyone else here on Cranberry Acre is doing great! Our ducks, Coconut and Hershey, have started laying again so now I have eggs to bake with. I have missed the duck eggs. We have rotated pastures, so now all the Cranberry Critters are in the pasture near the Store and Studio. The grass is so rich and green, that we have to put a grazing halter on Ms. Buttons. Ms. Buttons, before we adopted her, had foundered, so we have to watch what she eats. We also have found out that she has a sensitive stomach and is diabetic, so she doesn’t get to enjoy what most horses are able to enjoy. Our little problem child! To see more pictures of our Cranberry Critters, Please click on the link below. Thank you. It was an interesting month for March, with the snow and all. The Cranberry Critters were not excited to see the snow come back. They had enjoyed many days of sun bathing when all of a sudden we got snow! I think we all had felt a little out of sorts when the snow came. The ducks made the best of it by using the heated water trough for their own personal hot tub, but the rest of the animals were not thrilled at all. Our old tiny chickens (Ms. Puffy Cheeks and Kiwi), came inside to enjoy the heat. Their little bodies didn’t like the cold at all and Puffy was in molt. Now Mr. Bayne, he spent those snow days trying to find things to do around the house. Well they weren’t helpful, but made for some great pictures. I felt bad for my wild birds and gave them bird food in my feeder, so while I was sewing I got to watch them fight over who got the teacup first. It was fun to watch and hear. All in all we survived the last snow and the sun came back for us with days of enjoyment. Which was seen by all as they chewed their cud and sunbathed! Now Buttons decided that the duck’s pool was just the best play toy when it got warm, she plays in it! I fill it up and the horse plays in it. An ongoing battle of filling the duck pool, but it is fun to watch. The past few days we have been watching a robin hop around the Farm. At first I just thought it was a different robin at different times but started to notice that it was building a nest in the Maple in our Orchard. 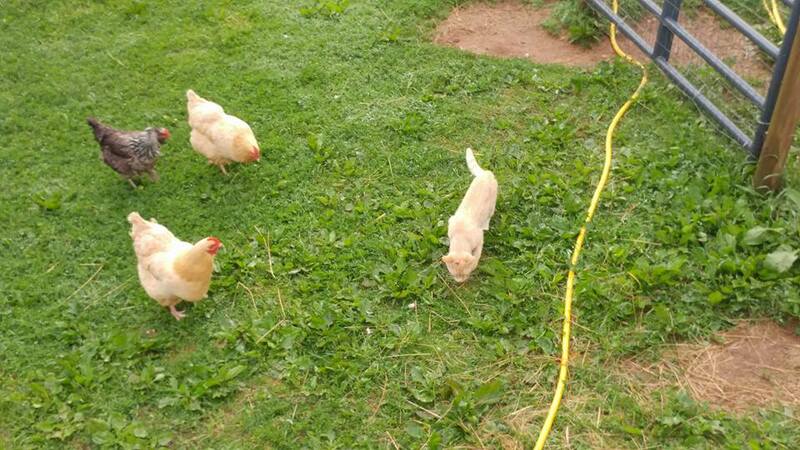 The chickens are not too thrilled with this robin and tend to chase him off when he comes to visit, but Buttons likes him around when she is grazing. I watched her walk towards him and watch him as she grazed in the Orchard. Animals are amazing things. If you would like to see more pictures of the Cranberry Critters, please click the link below. All the critters are just so happy for the new and warm weather. We had to move everyone to the spring pasture due to the new building being built, but they don’t seem to mind much at all. Now the birds are not happy at all with being on lock down in one pasture. Every morning I’m greeted with the screams and clucks of disappointment when they can’t get to the other pasture. They have decided that the stables are a great place for them to hang out. The horse hates it because in the morning the chickens are in her hay. We all have had to make adjustments as we grow, I guess the critters are making their own adjustments too. We actually have been blessed more with the appearance of Coconut. This duck has really been one of the hardest animals for me to photograph, but for whatever reason she allowed me one afternoon to invade her privacy and take some pictures. Our goats of been squirrely, I guess because of the warm weather. Spring Fever, has hit Cranberry Acre! The horse has been running around acting like she is a baby again and Bella just wants to fight with anything, a hose, a barn corner or even a child. Spring always brings out the crazy in our critters. To see more pictures of our crazy critters, just click on the link below. February 2017, All Caught Up! Okay, I think I have everything caught up from the old Blog. Now to start with what is going on this year to the barn and its critters. This year we are planning on painting the barn with its new edition. This will match the new Studio that is being built this year. Planning on a red and white barn, it’s very classic and I have always wanted one, so here is my chance. Unfortunately, we will not be getting any new baby chickens this year. We have a bunch of old birds that need to pass on. Because every bird ended up with a pet name, there is no one to butcher, so we wait. Our chickens are 3 to 8 years old, we are still getting eggs from them. Somewhere in that coop we have at least 6 birds laying which I’m grateful for. We do hope this year to maybe start reworking the hayloft in the old barn to be more useful. We will see how much time we will actual have with the plans already laid before us. Follow the growth of the barn on the photo album Cranberry Acre Barn , just click on the link below and also check on the critters of Cranberry Acre on the photo album link below, Cranberry Critters. Okay, I believe I have everything caught up on the Critters. Now to tell you where we at with the barn. The original barn worked while we only had 2 goats and some chickens. Last year we finished on the edition to the barn. 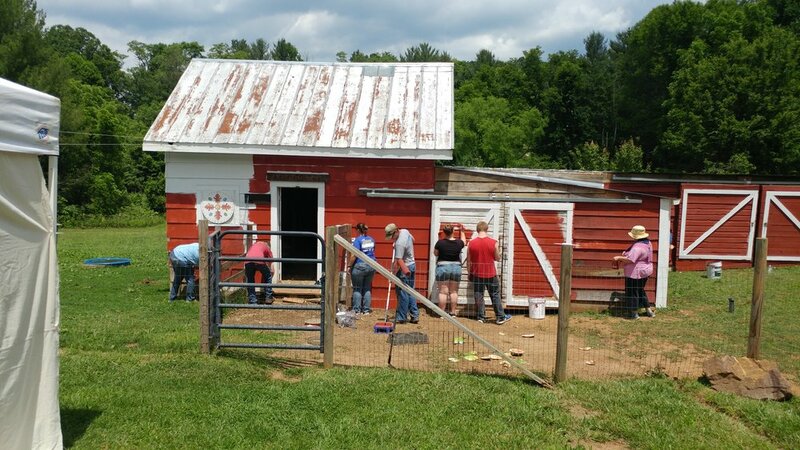 We decided before we got rid of the 3 dairy goats that we needed actual stalls for everyone. The new edition has 3 large stalls, with one being able to be split into 2 small one. Everyone has a place. Bella and Sparkles are in the large stall that splits into two, because they can’t stand to be away from each other. If one gets sick we have the ability to close a gate, but they can still see each other. Buttons has one of the larger stalls at the other end of the barn. We use the extra stall for grain and a wheelbarrow. It works! Attached to the stalls is a storage shed, to house all our equipment for the farm, tillers and mowers mostly. If you would like to see more pictures, just click on the link below, Cranberry Acre Barn. Let’s see, Mr. Bayne found us. We had just bought this house and were in the process of fixing it up so we could move in, when this tiny little kitten showed up at our rental house. At the time we already had two indoor cats, (Pico and Paco), so we were not in the market for a new kitten. I thought I had found this guy a home and then showed up at our rental house again a week later. He was weighing on my nerves and my heart strings. We started to move our stuff into the new house, so we were back and forth a lot. On one trip I heard a small meow from the back of the truck, it was Mr. Bayne! I then unpacked my stuff at the new house, packed the kitten back into the truck and headed back to the rental house, where I left him. We did this a couple of times. We had our last load of belongings to bring to the new house, which would soon be named Cranberry Acre, our first night in our new home. As I laid in our bed at 10PM, all I could think about was that kitten, being alone up at that house. I got dressed and brought him back to our new home. At first he didn’t stay in the house, he stayed in the building which would become our barn. He had food and water, plus a litter box, which he used. Ayla asked if he could come inside and after a little discussion, Mr. Bayne became an indoor /outdoor cat. One of the best cats I’ve ever owned. If you would like to see more pictures of Mr. Bayne, please click the link below to Cranberry Critters. 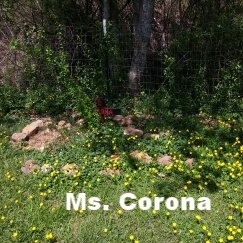 Cranberry Acre had a great and amazing dog named Corona. She would never hurt anyone or anything, she was 16 years of age when we had to say good bye to her. Was a very sad day here on the farm. We didn’t really think we wanted a new dog. We would always compare to Corona and we didn’t want to do that. It was 7 months after Corona had left us and I was sitting in my sewing room working, I realized how lonely it was in the house. Corona would always be in the sewing room with me, she followed me everywhere, now there was nothing. Kids in school, Wayne at work and the cat, Mr. Bayne was outside for the day, I was alone. I went on Petfinder.com and started to look at dogs. Wayne was reluctant at the time about getting another dog, but I still looked. Finally a week before Christmas, I started to call about some dogs we were interested in, everyone fell through for some reason. I was 2 days from Christmas and really wanted to give a dog a new home for the Holidays, and there in front of me was Dingo. I called and they brought him the next day and that is where our story begins. As much as we tried to stay away from a dog that reminded us of Corona, we actually found a dog who was more like her than we thought, but that is okay, because he is amazing. He can be crazy at times, and tests me at other times, but he is perfect for us. If you would like to see more pictures of Mr. Dingo, please click on the link below. Say hello to Ms. Buttons, who is our newest member to our family here on Cranberry Acre. We had 3 dairy goats for a while and they did what goats did best, which was get into everything. Needless to say we needed to find a new family for them. We always intend on keeping every animal here when we get them, but sometimes you can’t. When they left I was on the hunt for a rescue horse. Now living on one acre and already having two grazing animals, we needed to get a mini horse. A large horse would have not worked in our pastures at all and part of maintaining a small farm is knowing your lands capability to take care of the animals on it. We found Buttons at a local rescue and she has now been with us for about a year. All the attitude of a large horse in a small body. Now Buttons has come with a few problems, she was overweight when we got her, we found out she was diabetic, and then found out in a very horrible way that she has sensitive stomach issues. I am glad we have her, she has brought a new dynamic to the farm. These two goats were the first critters to make it to Cranberry Acre. The one with the two horns is Bella and the one with the bent horn is Sparkles. Bella and Sparkles are sisters, they both had the same daddy. They are Pygmy Nigerian crossed goats, which if we wanted to, we could milk, but it would be a sight to see. Anyone who has ever owned goats know they can be very trifling at times, but it wouldn’t be Cranberry Acre without them. These guys are going to be 8 years old this year. It is very hard to believe they are that old. If you ever make it out to the farm, these two are sure to great you at the gate to say hello and beg for a cookie. If you would like to see more pictures, please click the link below Cranberry Critters and it will take you to the photo album. I never really wanted ducks, due to the fact they can be really messy, but we did end up with a duck that needed a home very badly. She had been attacked by male ducks and was blind in one eye and almost blind in the other. Lovey the duck, started the madness of having ducks, at first she seemed okay with being the only duck, but as she got older we noticed we may need to get her a friend. We then got Hershey duck. Who was very happy to be her friend. Lovey duck about 6 months later crossed the Rainbow Bridge, leaving Hershey alone. We were then left with the decision of getting another duck. Hershey ended up very depressed so we ended up with Coconut. They are very happy with each other and seem to have bonded very well. If you would like to see more pictures of these guys, please click on the link below. I really wanted Guineas but due to their noise kept steering away from them. I finally broke down about 4 to 5 years ago and got 3. Larry, Curly, and Moe, which ended out to be 2 females (Larry and Curly), with one male, (Moe). 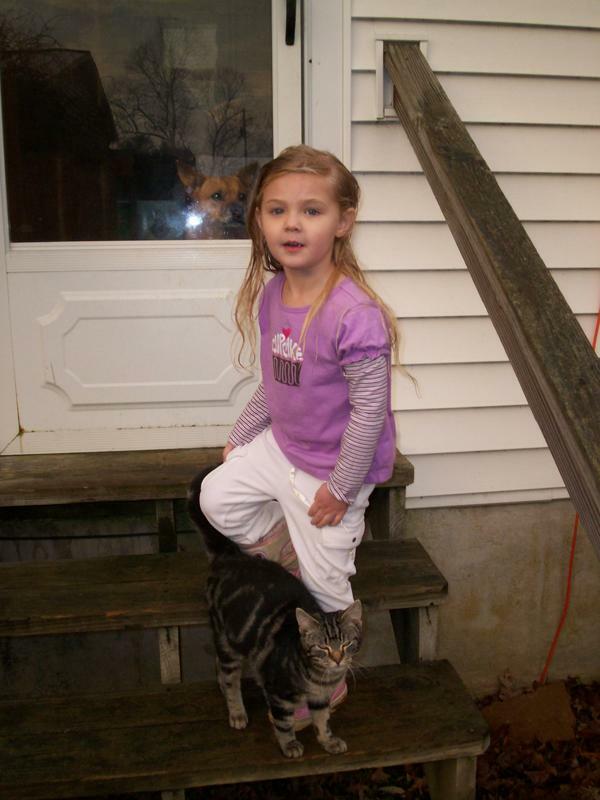 We lost Moe at the age of 2, the girls seemed okay with the loss and just followed the chickens at night to the coop. Curly last year got very sick and I was unable to medicate her and soon died. We had raised these guys as chicks and held them as much as they would let us, but when it came to medicating, let’s just say I would be the bloody one at the end, with a much stressed out bird. It killed me to see Curly pass, then I had to watch Larry deal with the fact she had no one to be with. She would chirp all the time almost mourning the loss. To my surprise one of our chickens, Kiwi, started to allow Larry to be with her and then our little girl Puffy Cheeks also would allow Larry to be with her. Larry has a new flock now and seems very content with the arrangement. 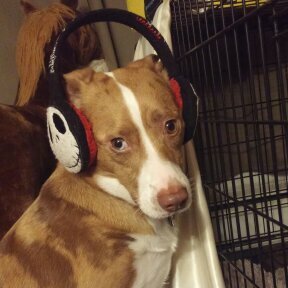 She doesn’t feel left out anymore. If you would like to see more pictures of these guys, please click on the link below. Baby pictures of our girls! Here on Cranberry acre we have a little of everything or we have had a little of everything. Since we only have an acre of land we need to have things planned out very well. Meaning we need to be aware of how many grazers we have on the property and if the pastures can take the abuse it will be given by the animals we have. One things that has always been a constant is our chickens. Each chicken has been hand raised by us. Sometimes kids have been known to have a chicken in their lap while watching TV. We started out with chickens that we would butcher and chickens that were pets, but this last flock got us and now we have pets! Our birds have the best life here. They free Range on our property and are fed scraps from the pantry window. These are some of the pictures of our girls when they were babies. I feel a farm is at its best when there are birds on it. There are more pictures of our babies on the Photo Album Page, just click the link below, Cranberry Critters, and it will take you to the photos. Our Girls all Grown up. Hard to believe that this picture is of the little chick sitting on my daughters chest watching TV. This birds name is Fudge. She has a sister named Chocolate and they are always together. Each one of our girls are named and in the Photo Documentary page, you will see wonderful pictures of our babies. Our oldest bird is a 7 year old Americana named Silver. She has been known to be very pushy at times but she does know how to keep a flock in check. We have no roosters here on Cranberry Acre, since we live so close to other houses we thought a crowing rooster would make people a little upset, so all of or chickens are girls. This flock will live with us until they decided to cross the rainbow bridge, just how it works. You get a name, you don’t get eaten! To see more photos of our girls just click the link below Cranberry Critters and it will take you to the Photo album. Cranberry Acre has had some pretty hard losses. Animals don’t get to live a long time and when your farm becomes more of a petting zoo, well it get harder to say goodbye. Our first chickens, that were pets, were the hardest. Cookie and Speedy, were Wyatt’s and Ayla’s first chicken pets. They were great little birds and let the kids do whatever they wanted to them. Over time we had many other losses, house pets, more chickens and a duck. Never seems to get easier. It is very hard not to get attached, even harder for children to understand why. I know for me there isn’t a day that goes by that I don’t think of them, some of the critters on Cranberry Acre left their mark on my heart. Many of these critters have a write up on our old Farm Blog. You can find a link for the old Blog, on the bottom of this page, if you want to learn more about them. I just didn’t want this new webpage to be without them. There will be pictures of these guys on our Cranberry Critter photo album also. Just click on the link below, Cranberry Critters, and it will take you to the photo album. Cranberry Critters who have moved on. Cranberry Acre has grown and sometimes animals just didn’t fit on our one acre farm. We tried our hand with Icelandic sheep, but we had one wither, Edward, who was pretty aggressive to one of our children. We had to sell them, but were very picky on who was going to take them. Both Brownie and Edward, ended up at a Homestead, which was going to use them for their fiber. We then took on Dairy goats. These were French Alpine milking goats and we were going to milk them. The mother Jojo and her two small babies were great at first, but in time when the two little ones grew up, Luther and Griffin, we found out they were destructive. They were also pretty big, 135 pounds was the average on these guys and they would push their weight around when they could. This was the hardest animals to get rid of. We had raised Luther and Griffin since they were 3 days old. We were very strict on who got these guys and luckily we found a family who loves them. They send us updates and pictures of the babies and Ms. Jojo. These have been the only animals we have had to sell, it’s hard to say goodbye but sometimes the animals just don’t fit. If you would like to see more pictures of these guys, just click on the link below. Thank you for supporting Cranberry Acre. Please visit our store by clicking on the link.